destructed the roots of disparity among the same citizens. Initially, while traveling in the public transportation in the United State; black people had to give their seats to the white if they wouldn’t do so, they were arrested by the police and sentenced to the jail. Due to the fear of imprisonment, every black people used to give their seats to the whole ones but the Rose Parks didn’t give her seat to the white passenger. The driver called the police and she was arrested. During the same time, many black people came out in the protest for the rights of black people and to establish the equality among the black and white people. It was on December 1, 1955, in Montgomery, Alabama, Park refused the bus driver order to give up her seat in the color section to a white passenger after the whites-only section was filled. Before her, many others had taken the similar steps and all of them were arrested, but she succeeded to break the glass ceiling with the support of other black people’s voices. Park’s act of defiance and the Montgomery bus boycott symbol the important role in civil rights movement and she has been the international icon of resistance to racial segregation. She was the secretary of the Montgomery chapter of National Association for the Advancement of Colored People (NAACP). 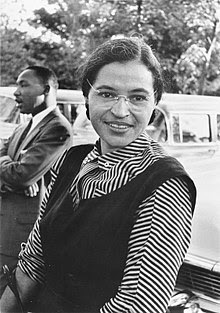 She cooperated with the civil rights leader Martin Luther Kings and they become able to establish the civil rights and received the national recognition. After the retirement, she wrote her autobiography and continued to work for the justice and rights as the disparity hadn’t over and numerous things were there to be work done.